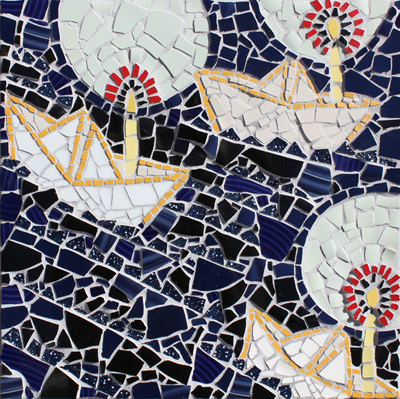 Here are two new mosaics that I made, that will be on display and are for sale at the Strecker-Nelson Gallery in Manhattan, Kansas, from early November through December, 2011. 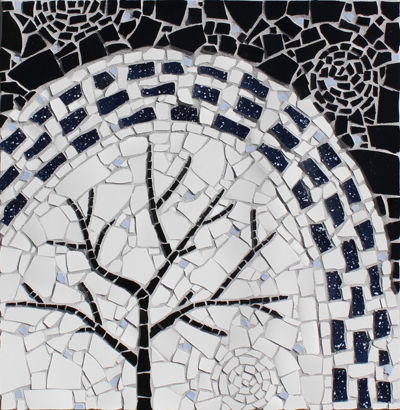 Each Mosaic, Winter Tree and From the Dark, includes many hours of work. I first created the basic concept and design for each, and then shaped the ceramic pieces to fit where I wanted them to go. The images change as I proceed, and I design each piece anew as each element is placed and new relationships are formed. I find the process to be a bit like putting together a puzzle that evolves as the creative process unfolds. I made both mosaics from ceramic dishes that I found over time, mostly from thrift stores. Sometimes friends give me the remains of beloved dishes that were dropped or met some other dark fate, and I incorporate these, too. I stockpile dishes of particular colors that inspire me or that I know I’ll need eventually, especially black and white. Each piece was inspired in part by the impending winter. I wanted to create a stark winter beauty in the piece Winter Tree. I have been thinking about the arch that appears in this piece for a long time. It is a personal symbol for everything that is here within, a bit like a rainbow but matter of fact and without the emotion. The other mosaic, From the Dark, is about illumination — the light that carries one through the dark — a dark winter or a dark time. The carrier of the light in this piece for me connotes fragility, yet the medium renders these papers boats rather solid. The boats were interesting shapes for me to work with. The Strecker-Nelson Gallery is located at 406 1/2 Poyntz Avenue, Manahattan, KS. Hours are Monday – Saturday, 10 am – 6 pm. Phone the gallery at 785-537-2099.